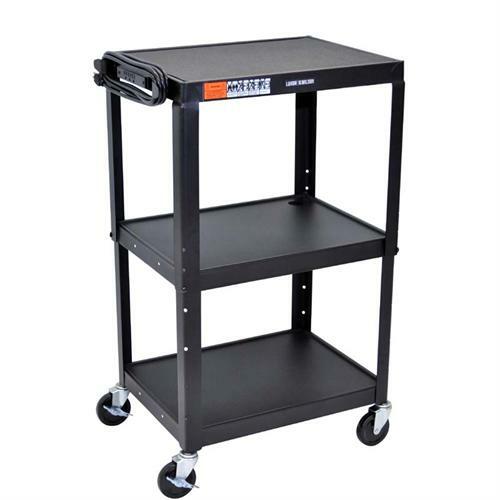 More on the Luxor Adjustable Height Open Shelf AV Cart (Black) AVJ42 below. Luxor's AVJ42 Multipurpose steel utility cart is perfect for use with audio/video equipment and more. Tables are robotically-welded for stability, with easy-access cable holes to keep the cart clean, organized and safe. Roll formed steel shelves with powder coat paint finish in black. Also available in other colors. See related products below. Rolling cart with four 4" silent roll, full swivel ball bearing casters, two with locking brake. Easy assembly with all hardware included. Also available with a locking, inset cabinet (model number AVJ42BC) and big wheels (AVJ42B). See "Related Products," below, for more information.